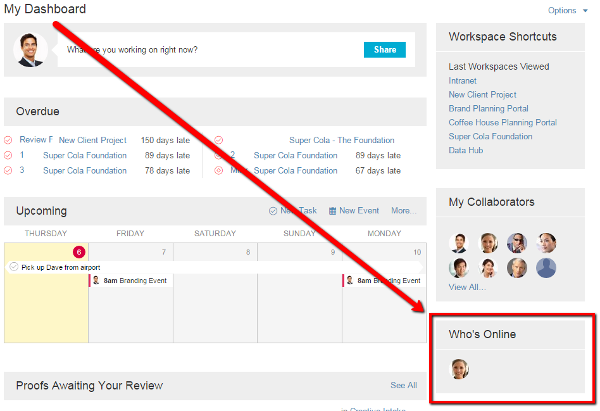 Who's Online feature allows users to see which workspace members (both internal and external) are online at that time. This feature can be found in the My Dashboard section next to the workspace shortcuts menu. The Who's Online feature displays up to sixteen workspace members at once. If more than sixteen members are online, then the phrase "and several others..." will appear at the bottom of the application. Note: Who's Online refreshes every 3-5 minutes, showing users who are actively viewing a workspace page.